I’d been doing it wrong for my entire life. Wrapping a potato in tin foil and sticking it in the oven or on a BBQ is more like steaming your potatoes than baking them. 2. Brush the potatoes lightly with olive oil and salt. 3. Place potatoes directly on the rack in the oven at 400 F for 45 minutes. Be prepared for the best baked potato ever. 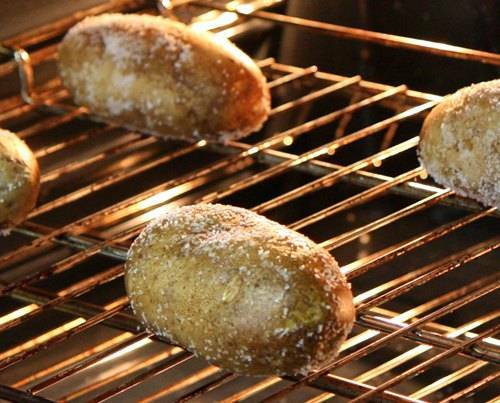 Don’t be surprised if your oven smells like cookies are baking in there – it’s the yummy potatoes! Serve with your favourite topping. If you’ve never tried it, homemade pesto on top of real baked potatoes is to DIE for.